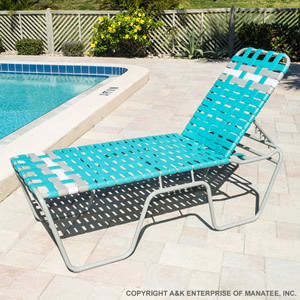 The C200B 20" Cross Strap Patio Chaise Lounge is an aluminum outdoor lounge with an extra-high seat height for easy use. The basket-weave cross strap pattern of the 2" vinyl straps provides extra support and unique styling. The C200B 20" Cross Strap Patio Chaise Lounge has built in safety features, such as a headrest that defaults to the top position and a pinch-proof frame design at the headrest. Made from 1" round extruded aluminum, the C200B 20" Cross Strap Patio Chaise Lounge is light enough to move by hand by sturdy enough for commercial outdoor use year round. Customize it to match your property!